Some are born leaders, some achieve leadership and some have leadership thrust upon them. Then, there are leaders who unknowingly thrust themselves upon others. Some are born leaders, some achieve leadership and some have leadership thrust upon them. Then, there are leaders who unknowingly thrust themselves upon others. The putative prince of India’s pre-eminent political dynasty, Rahul Gandhi, has finally staked his claim to the throne, even though it is yet to be vacated. In Bangalore last week, the 47-year-old Congress president gave his signature dimpled smile and bashfully conceded to an audience of eminent citizens that he wouldn’t mind becoming the prime minister if his outfit emerges as the largest single party in 2019. Though he was ostensibly responding to a question, his eager body language gave away his desire to scribble his name on the list of Nehru-Gandhis who have occupied the most powerful corner room of the imperial pink stone edifice of South Block on Raisina Hill. Thinking outside the Family box is impossible for the Congress, but it is for the first time that a Gandhi has announced his own coronation rather than his party formally proposing the name. The fait accompli for the Congress need not be a fate accomplished by its fellow travellers. So far, none of the Congress allies have endorsed Rahul as a potential prime minister. He thundered at a Karnataka poll rally that Narendra Modi will not return as PM in 2019. For a leader whose party won less than ten per cent of the total Lok Sabha seats in 2014 and lost numerous states over the following years, it is indeed a tall claim as well as a reflection of new-found confidence. According to local Congress leaders, RaGa has sensed victory in Karnataka and has convinced himself that the worst is over. A win would clear all road blocks to his ascendancy since his party would be preparing the garlands even before the roses have been bought. In the past, India has had three Nehru/Gandhi Parivar members as prime minister, whose tenure extended over half of the time period since Independence. But not one of them had proclaimed themselves as the leader of the nation in advance. But Rahul is not Nehru, Indira or Rajiv. Barring genetic connectivity, there is little in common between them. He is reclusive, but is also impulsive and inconsistent in his political conduct. Even after 14 years in politics, he is yet to emerge as the natural alternative prime minister-in-waiting. Small mercy, he is no longer a subject of ridicule and derision as much as he was until recently--a significant image gain for him. Moreover, his admission is a significant deviation from the Gandhi Parivar’s resolve not to lead a coalition government where a Gandhi would have to bear the humiliation of being constantly questioned by a local leader or a tiny regional satrap. In 2004, Sonia had decided to spurn the chair in favour of Manmohan Singh to retain her Gandhian superiority over the institution of the prime minister. However, hardly any discussions or deliberations regarding the name of a possible replacement to Modi as the next prime minister are audible in the political universe. Yet, Rahul’s self-anointment was surprising not just to his own party men but also to other Opposition parties. While the BJP has never taken Rahul seriously as a credible contender for the PM’s post, its opponents are struggling to forge an anti-saffron configuration. They will wait to announce their respective choices only after the 2019 results are out. As the BJP took Rahul’s premature declaration as a sign of feudal arrogance and ignorance, his ambitious confession became a much-needed rallying point for the Congress, for which Gandhi is oxygen. 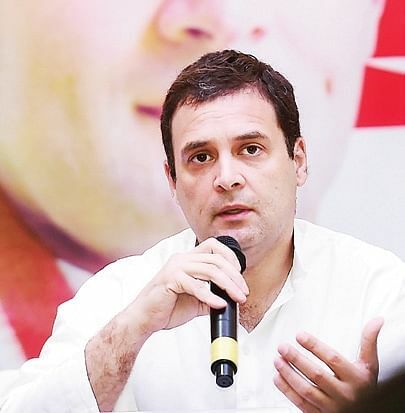 Rahul’s new-found political confidence stems from the fact that though the BJP has constantly chosen him as its prime political target, there have been no surly susurrations within his own party. During the Karnataka elections, all BJP luminaries, from the prime minister to the party president and important Union ministers, launched blistering attacks on Rahul and his clan instead of Chief Minister Siddaramaiah, since the ruling party wanted to convert Battle Karnataka into a tug between RaGa and NaMo, in which the PM would emerge as a decisive winner. An unintended by-blow of this strategy was that Rahul received disproportionately bigger exposure while Siddaramaiah elected to raise himself to the prime minister’s level. *Rahul can become prime minister in 2019 only if the Congress grabs more than 175 seats as against its current 45. Also, its current allies, such as RJD, Muslim League, DMK and others, should bag more than 50 seats. In such a situation, even Sharad Pawar, whom history has tantalised with the frozen distance so often, may push his NCP to support a Congress-led government. Since the Left has always been soft towards the GoP, they could corral small regional parties to support such a government. Rahul is unlikely to realize his dream if his party fails to cross the magic figure of 175, which would suggest the mandate was not in his favour. *Rahul’s future would also be dictated by the performance of regional satraps like Akhilesh Yadav, Mamata Banerjee, Naveen Patnaik, Chandrashekar Rao and Mayawati. Together they can capture over 100 seats. Chandrababu Naidu is expected to play an important role in forging a non-BJP administration. Since the Congress is already marginalised in Andhra, he could be amenable to the idea of supporting an amenable government led by Rahul Gandhi because he can then dictate favourable terms for his state. *Rahul still stands a chance if a combined non-BJP front wins more seats than the Congress but fails to choose one among them as the prime minister. At the moment, Telangana Chief Minister Chandrashekar Rao is criss-crossing India to forge a non-BJP, non-Congress alliance, but has met with little success. *Rahul may have to sit outside the ring if the newly-formed BSP-SP alliance creates a wave in Uttar Pradesh by sweeping over 60 seats. In that case, Opposition leaders may settle on a younger leader like Akhilesh over Rahul. Whatever be the Karnataka poll outcome, Rahul needs to be aware that 'Gandhi’ (in the Nehru mould) is no longer a unassailable nationwide brand and a perennial password to the corner room in South Block. It will need many others as crutches to hobble along on the path to power. Jumping from plebeian to PM needs much more effort! 1. This is a good analysis of current political; scenario. By announcing his desire to be Prime Minister (PM), Congress President Shri Rahul Gandhi may have amused many a political observer. Question is whether Shri Gandhi would be acceptable to the ‘Third or Federal Front’ which some opposition parties wish to form as an anti-BJP alliance. My guess is that he won’t be accepted as PM unless Congress wins more than 175-80 Lok Sabha seats, an unlikely possibility. 2. Assuming that Congress party will be in power in the Centre after Lok Sabha election in 2019, and Shri Rahul Gandhi will be the Prime Minister, the Congress party should come out with a “White Paper” (WP). The WP would have to be a comprehensive document that must deal with (a) problems like lack of job opportunities and consequent unemployment, (b) farm crisis and farmers’ suicides, (c) inflation, and in particular, difficulties of senior citizens who are not govt. pensioners, (d) existing deficiencies in GST etc. etc. The WP must give details as to how the Congress party would deal with all these issues. The WP would have to be released, as early as possible and in any case before December 2018, well before next year’s Lok Sabha election, so that citizens would be able to study the WP and then appropriately respond. I am amused that the stalwart critic like Chawlaji took RAGA so seriously as to spend time on an analysis that is already obvious to people, though not in the expert vision as it emerged from his pen! The problem for India is not RAGA or BJP as a layman like me sees it, but a leader who could steer the nation in so much social, political and economic chaos - often amplified by interest groups to gain an unholy edge over the rulers in people's mind! As there is no choice right now among the 'leaders', Modi himself often losing his cool and his party men aggravating conflicts from within and without (can we call it 'sibling rivalry' for one-up-manship?) an article making us (major readers) no wiser, had perhaps emerged - in my opinion. May be the author had more subtle reasons which a simpleton like me could not see through! The way things go on in BJP had greatly dampened the high hopes of average citizens anxiously waiting for a swift, healthy change in national political setting that would pave way for a more comfortable living! Experts: you may be talking to other experts through articles like this - as they could read between lines for the 'dig' or for any critical 'tips' for some people in the fray - but things are too tough in real world of the commons that we expect a different discussion on current issues!